First, they came for your Tortilla chips. 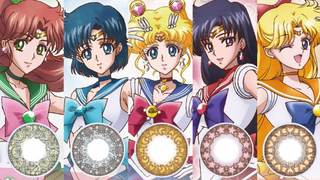 Now, the Sailor Senshi are coming FOR YOUR EYEBALLS. Who will stop this endless tide of magical girl merchandising? No one. No one I say! These Senshi-inspired contacts are going on sale later this month at Village Vanguard in Japan, with each pair representing a different member of the team. At 2,484 yen (roughly $21) per set they're reasonable enough for a pair of contact lenses. But what's cost when it comes to applying your love of Sailor Moon directly into your eyeballs? As a glasses wearer, personally contacts have always been offputting - I get freaked out about jamming something into my eyeball so I doubt I'd ever want them. But even with that aside, these just look freaky. I mean they obviously won't restrict your vision (at least I hope not - otherwise they'd be pointless! ), the idea of replacing your natural irises with these designs conjures some exceptionally weird imagery in my mind.